I started morning tubs this past year as an alternative to traditional morning work/worksheets. I have loved being able to integrate STEM concepts and purposeful play into our daily routine. I have also enjoyed seeing the classroom community and relationships that are built by allowing students to have the first minutes of the morning to socialize, problem solve, share ideas, and work cooperatively. At the beginning of the year, I used items from around my room to fill the bins. Legos, pattern blocks, wooden blocks, geoboards, puzzles, snap cubes, play doh, etc. These materials encourage building and design, but don't require much explanation. After reading The Most Magnificent Thing (a precious book that encourages creativity, critical thinking, perseverance, and engineering) I go over my expectations for morning tubs--which is to use materials to build and create, work nicely with others, share materials, and clean up. For the first day of morning tubs, student tables (numbered 1-5) are assigned to the tub that matches their table number. Table 1 gets tub 1, Table 2 gets tub 2, etc. They will go to one tub each day, working only at the assigned tub. The next day, whoever arrives first for the group will grab the next number tub (if they had 1 yesterday, they will get 2 today). 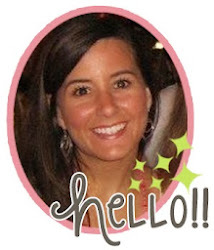 I use a cube organizer and tiffany blue tubs from Wal-Mart to hold our activities. This month, I posted a few pictures on my Instagram account sharing what I planned to do during January with the morning tubs! I literally bought NOTHING for these tubs. I found all items inside my classroom or at home. 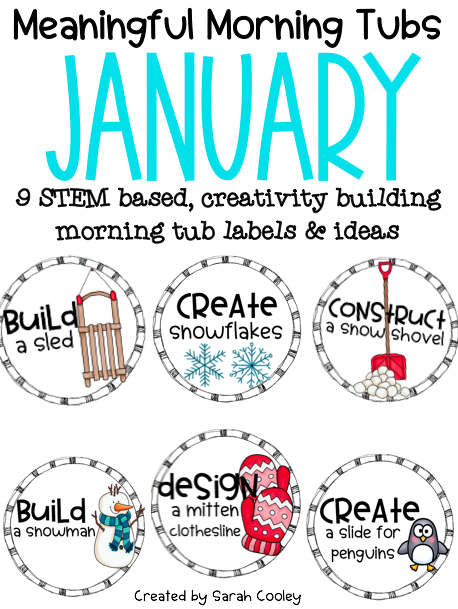 I wanted to make all tubs snow themed, and came up with a few simple ideas that the kids will rotate through for the month of January. I love watching my students work together to think creatively about the items. They come in each morning so excited to see which tub they will get, and from the moment they get started, they are engaged in play based WORK. They love beginning the day this way, and I love it too--because I am able to complete all morning tasks for our classroom while my students busily work on their own. Is our room a little noisy in the morning? Yes. Students are talking, planning, laughing, thinking out loud, sharing, and having a blast. I had a lot of questions about the tubs and how they work, so I created labels and listed ideas for materials in a resource that you can find here. I plan to create themed morning tubs like this for each school month. This snowman, though. He looks a lot like Olaf! I love this Build a Snowman tub--I added mini cupcake liners for hats, cut little pieces of orange pipe cleaner, added buttons, googly eyes, and scraps of fabric for scarves. Mitten clothesline. Dry out those mittens that get wet in the snow! Leave me a comment sharing STEM concepts you would like to see in future tubs! My goal is to create a set of these for each month of the school year! Hey there! How long do you give for these activities? They are great!